1935 Ford Model 48 “Tudor Touring Sedan”. Complete documented “Frame Off” restoration. 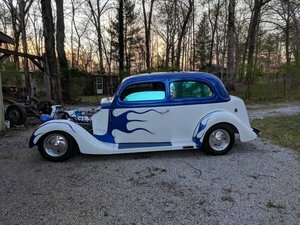 This Beautiful 1935 Early Ford V8 is in museum quality fresh condition. The restoration was done by the renowned restorer Auerbach Restorations in Millington, Michigan. Only 3 road test miles since completion of restoration. Authentic paint, interior fabrics, accessories and details. Green exterior, Tan Mohair interior. Completely rebuilt engine, transmission and drivetrain. New “Ribbed Sidewall” Goodyear 650-16 Retro/Deco design tires. This classic is “Correct” for 1935 factory specifications with the only non-conforming upgrades found under its hood. It has a 24 stud flathead V8 motor that runs perfect. We added Offenhauser heads and a dual carburetor intake manifold with a pair of very rare vintage Eddie Meyer “finned” triangle air cleaners and headers. Car has dual exhaust and upgraded to 12 volt system with the battery in the trunk. Also upgraded to hydraulic brakes. Custom show chrome plating where visible, all panel spaces are perfect as only Auerbach can achieve. Paint is best of the best, again Auerbach. over $87,500 spent on this fresh restoration. This is your chance to own this fantastic early Ford V8. Undercarriage is as nice as the paint. ​ Please Note The Following **Vehicle Location is at our clients home and Not In Cadillac, Michigan. **We do have a showroom with about 25 cars that is by appointment only **Please Call First and talk to one of our reps at 231-468-2809 EXT 1 ** FREE Consignment Visit Our Site Today Easy To List Your Vehicle and Get it Sold in Record Time.